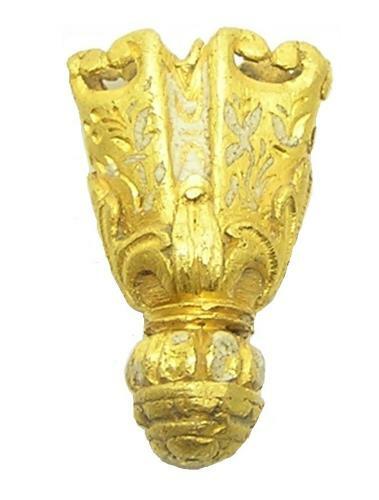 This is a superb Renaissance (Tudor Period) gold and enamel aiglet, dating to the 16th century A.D. It is a magnificent piece, especially when you consider it was only worn as a 'lace-tag' (sewn on to rich brocaded fabrics by royalty and nobility). This example is intricately decorated with floral spandrels set with white enamel. The majority of aiglets are made from pewter, bronze and occasionally silver. Gold examples have been recorded (BUC-E33633) it is thought these were worn in hats or court regalia in the presence of the king or queen.Similar large aiglets in gold appear on the clothing of Mary Nevill and her son Gregory Fiennes by Hans Eworth, 1559. Further examples and history of aiglets can be found in "Aiglets Medieval Post Medieval and Modern" by Gerald A. Livings. This is a rare and presumably royal gold aiglet, in good excavated condition. DATE: c. 1500 - 1600 A.D.